I recently had to deal with the rather traumatic news that my office location was changing from Clerkenwell to Kings Cross/Camden. Not only would it be further out for me to travel (OK - one more stop on the tube), but to my mind, in comparison to the culinary hotbed that is Clerkenwell - Kings Cross and Camden are gastronomic wastelands. Luckily for me - after much wailing and childish tantrums, it turns out things aren't quite as bad as I first thought. There are gems in the area, and Hache in Camden is one of those gems. When it comes to burgers Hache is regularly singled out as providing the best in London, which is quite a reputation to live up to, so it was with pretty high expectations that I visited for lunch with a work colleague. Unusually for Britain, on the afternoon I visited the sun was blazing, and Hache has a nice open frontage with a few tables overlooking the pleasant street outside, it's perfect for a spot of people watching. We grabbed a prime front of house table and studied the incredibly varied menu - pretty much every combination of burger contents you can imagine with a variety of meat options, Scotch beef steak, lamb, venison, chicken, duck, fish and a pretty extensive Vegetarian selection. I ordered the Steak Canadian, a Scotch beef steak burger with sweet cure bacon and mature cheddar cheese, I asked for this cooked medium rare. On the side I ordered some frites. My work colleague, being a veggie - went for the 'Le Grand Champignon' which consisted of portobello mushroom, roasted red peppers, courgettes and pesto - to this she added some goats cheese as an extra and a bowl of chunky chips. Our order arrived rapidly, and it was pretty impressive to look at. Huge burgers, and massive portions of chips (Think we could have got away with one bowl between two). So, is this the best burger in London? I haven't tried all of the pretenders to the throne - so who can say. But, what I can say is, It's certainly the best burger I've ever eaten, in London or anywhere else for that matter. It was great. Perfectly cooked, the bacon and cheese used in my burger were obviously quality ingredients and tasted good- I was impressed. My work buddy was equally pleased with her food. The proof of the pudding is in the eating, as they say. (or should that be burger?) And despite the massive portions - I scoffed the lot - clean plate - including the frites, which were also very good....especially dipped in the mustard mayo thoughtfully provided in the selection of mustard's and sauces with the meal. I also managed a fair few of my colleagues chips who's appetite, thankfully isn't quite as bottomless as mine. 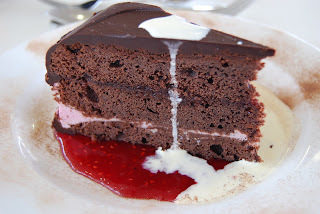 There were desserts on the menu, but I was stuffed silly and couldn't even look at them, that's unusual for me, I almost always shoehorn one in. Service was efficient, fast and the staff very friendly. The two Burgers, two bowls of chips, and two diet cokes, including service came to around £13 a head, which considering how damn nice the food was, is a total bargain in anyone's book. So, all in all Hache gets my vote I'll certainly be visiting again. If anyone has any great lunch suggestions for the Camden/Kings Cross area - please drop me a line. This month's favourite pasta dish. During the week, I eat a lot of pasta. It's so quick and easy to throw something fresh together, it's filling and the variety of ingredients you can combine to make something new are practically endless. As I've mentioned a few times previously on the blog, one of the best recipe books I own is The Eagle Cookbook 'Big flavours and Rough Edges'.......It contains some really nice, quick and unusual pasta recipes. As far as I know, the book is still out of print, so if you see a copy - snap it up, it's excellent. This recipe is featured in the book, and it was so nice - I cooked it for two consecutive nights running, and then again the following week. (Although it helped there was a 2 for 1 offer on fresh unshelled Peas at the supermarket). Which incidentally, while they're in season I urge you to buy and eat - it's almost calming, standing there shelling peas... and they taste fantastic. 200g shelled young peas (about 500g unshelled weight). 150g Smoked Pancetta or dry cured smoked streaky bacon, cut into strips. 2 Tablespoons freshly grated Parmesan Cheese. A dozen Basil Leaves, torn as you use them. Boil the peas in the salted water until just cooked (4 Min's), then drain. Gently melt the pancetta with the butter for 10 Min's or until the fat has run and the pancetta has become crisp. Add the peas to the pan and cook gently for a few minutes. Meanwhile, cook the pasta in a large pan of salted water until al dente. 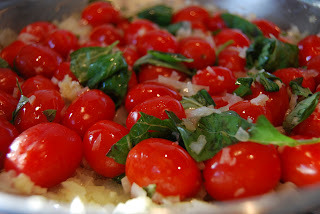 Drain and mix in a warmed serving bowl with the ricotta, Parmesan and torn basil leaves. (Personally, I reserved a little of the pasta cooking water and stirred it into the pasta at this stage to make it a little more 'silky'). 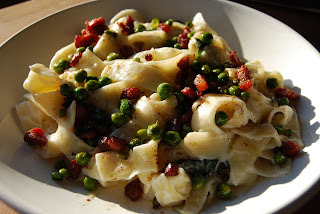 Finally, reheat the peas and bacon, and pour over the pasta. 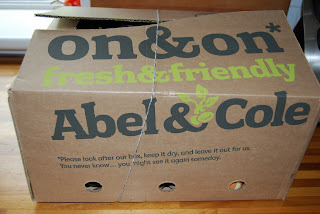 Abel & Cole asked me if I would like a free box of goodies, in exchange for a review. Now this threw me into a bit of a ethical quandary. Y'see I am essentially a no good dirty whore who will sell myself to the highest bidder for a pittance. But my blog, that's a different matter.....it is as yet unsullied by advertising or links, it is pure and noble.....it is innocent. Free Food is even better. I'm happy to write a review in exchange for a freebie, but - In order to maintain my blogs pure as the driven snow reputation I will state that I was given said item free in exchange for a review - and I reserve the right to rip the product to shreds if it's rubbish. I'd just like to point out Abel & Cole made no demands, just provided the freebie and asked for a review. The box arrived on Wednesday - it was delivered around 7.30am, which is pretty impressive. I was incredibly excited, it felt like Christmas,....except....errrr..... it involved vegetables, anyway, I just couldn't wait to find out what was inside the box. We have, Apples, Carrots, Courgettes, Green Lettuce, Melon, a Punnet of Nectarines, Potatoes, a Red Pepper, Spring Greens and White Onions. Everything was suitably fresh and organic looking, dirt on the spuds etc. I was happy. On the other side of the receipt tucked into the box, there was a very handy selection of recipes and tips to help me use the vegetables. I had a quick look at the Abel & Cole website, and they list even more recipes for every conceivable piece of veg or fruit - so, it's all very well thought out and organised. This was a week ago, and I've more or less eaten everything in the box apart from the spring greens. Everything tasted good, the produce was fresh and there's the virtue of it being organic, as local as possible and seasonal. There's also the excitement factor of not knowing what your getting, and the stretching of your cooking skills as you ponder how to cook some unfamiliar vegetables. (Would you believe I've never cooked Spring Greens?). 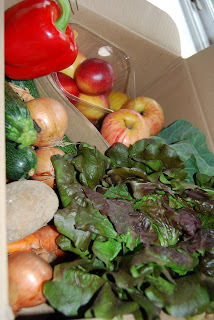 The only problem I would have personally with a weekly organic box is that I plan my meals around what I fancy cooking that week, not around which vegetables turn up in the weekly box. But that's probably just me. I leave you with this final, but extremely important thought, If anyone would like to send me free stuff (The more expensive, the better), In return for my opinion, then feel free to drop me a line. What I've been cooking - a roundup. As a budding food blogger, each time I cook something new, or that I feel is somehow interesting, I take a photo of it. 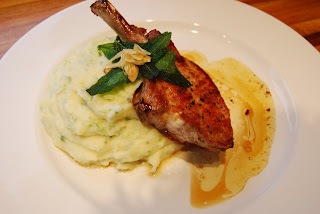 Sometimes posting the photo and writing the dish up on this blog. Seeing as not everything makes it onto the blog in its own right, here's a selection of the food I've cooked (and eaten) in the past two weeks. 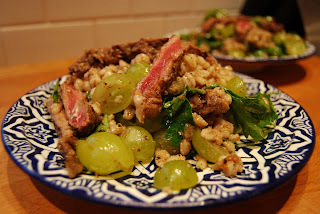 First up, served on my lovely hand painted plates I bartered badly for in Marrakesh, we have seared sirloin salad with barley, grapes and sumac. The recipe is from the Moro cookbook, the Sirloin steak is from Woodford Meats Farm Shop (As recommend to me by The Ample Cook). This was great, really enjoyed this, the sumac is a Middle Eastern spice, and has a sour flavour like lemon, and obviously the grapes are sweet which balances it nicely. I'd definitely cook this again. Here we have a really simple meal, but it was great. 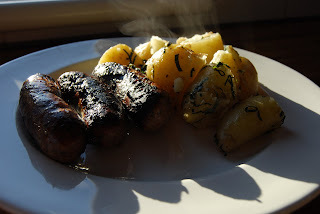 Excellent Gloucester Old Spot sausages (again purchased at Woodford Meats Farm shop). With Jersey Royal New Potatoes with butter and mint. I actually spent the time to cook the sausages properly, frying on a really low heat for 40 Min's until they became dark, sticky and marmitey. Lovely. This is an old favourite, I've cooked it countless times. 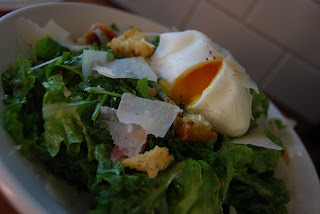 Warm Bread Salad of Crispy Pancetta, Parmesan and Poached Egg. It's a Jamie Oliver recipe from Happy Days with the Naked Chef. It's Not exactly the healthiest salad you'll ever eat, but it's so good and quick to knock together as well. Another recipe from Mr Oliver, this time from his 'Ministry of Food' cookbook - Chicken Korma. First time I've cooked this, and I've got to say it was actually really good. 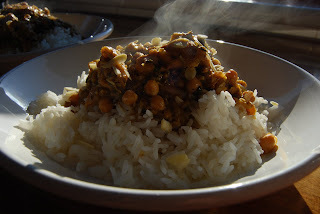 I started making this on a weeknight at 9-45pm, to be eaten the next evening, so giving time for the flavours to come together....I always find that Curry's and stews taste better the next day. I'd opted to make my own curry paste (no jars here).....and realised once I'd started cooking that I was missing one vital ingredient. I rushed down the corner shop and got there just before it closed at 10pm and was amazed to find that they actually did have some dessicated coconut. Phew. Last but not least, we have a bit of an enigma. 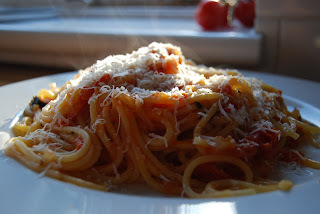 Spaghetti with cherry tomato sauce. I thought this was average at best, but the Girlfriend loved it scoring it a massive 9 (On my patented 'out of 10' taste scale). It's an Aldo Zilli recipe, and despite the sheer middling banality, it did make a very colourful picture cooking down the tomatoes, onion, garlic and basil. Oh, the Spaghetti is De Cecco, which is a bit more expensive than the other brands - but it is in a league of its own. If you don't believe there's much in it - buy some supermarket own brand pasta and some De Cecco and compare. You won't believe the difference. With dried pasta, you pay for what you get. Oh - Finally - I've been eating Kelly's of Cornwall Ice Cream (It's on introductory special at the supermarket right now). Honeycomb, Caramel flavour, and made with Clotted Cream......It's really very good, almost toffee'ish.....and my dentist is going to love what I'm no doubt doing to my teeth. So it's win/win for all concerned. A May weekend in Hastings. 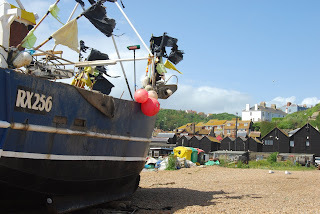 Last month, I visited Hastings for a weekend. I haven't been there before, and as is usual for me, I spent quite a while online trying to find out where to eat and what foodie delights to track down beforehand. You see, when it comes to eating, I don't want to wander around looking for somewhere to eat lunch, peering through windows at menus and chancing my arm eating disappointing grub, only to find out later there was somewhere excellent around the corner. I want to know where I'm eating lunch before I even arrive and I want to know that it's going to be good. 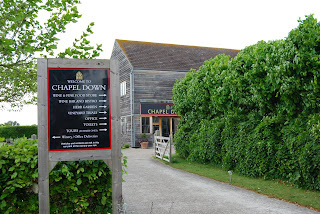 Bearing this in mind, on the drive down through Kent, I planned to pop into the Chapel Down Vineyard to stock up on wine. I've been a fan of their wine for quite a while, having tried a glass of Bacchus reserve in Butlers Wharf Chophouse one night, and being blown away by how light and fresh it tasted, amazed that it was English Wine. So much so, that I remembered the name and decided to drive down to the Vineyard in Kent to buy some soon after. That was a few years ago now, and I've visited quite a few times and drank a fair old bit of their wine. I picked up a half dozen bottles of the Bacchus reserve, and a few bottles of the Rose - not something I normally drink, but I had a taste and it was gorgeous. With the boot of the car full of wine - it was onto Hastings. The first restaurant I ate at on the trip was 'St Clements', just down the coast from Hastings in St Leonards. I'd read good reviews online during my pre-trip research, and that it is run by an ex-Ivy, Le Caprice Chef and what a good choice that turned out to be. Excellent and attentive service, seasonal, local produce and wine, and faultless food. I had a really good and enjoyable Meal and considering how great the food was, the prices weren't bad at all. 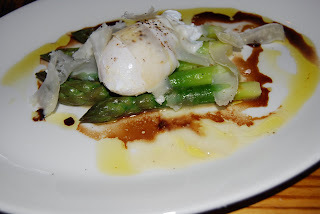 Starter - Kent Asparagus, Poached Egg, Parmesan, Balsamic and Olive Oil. 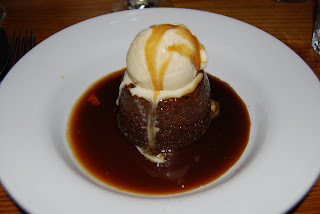 Dessert - Black Treacle Pudding with Butterscotch Sauce and Vanilla Ice Cream. Now - I'm in Hastings, its by the sea, the home of all things aquatic - I have to eat fish and chips. According to my exhaustive research, the best place is apparently Maggie's, a hut pretty much on the beach frequented by the Fishermen themselves. All well and good, but I turned up on a Saturday lunchtime in blazing sunshine and with predictably crushing disappointment, it was fully booked. There was not a table to be had. I did the research, but forgot to book....stupid! But - my forward planning provided a backup in the shape of 'The Mermaid Restaurant' also located within spitting distance of the beach and also supposedly purveyors of excellent fish and chips. 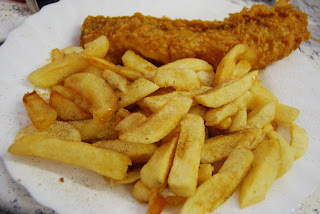 Once again, the time spent beforehand reading up online wasn't wasted and the Cod and chips were really very good, the chips especially, having a slight crunch. It may have had a bit of that worn out 'seaside caff' feel to the fixtures and fittings, but I find that look kind of appealing, so no complaints there. On the Sunday afternoon, I decided to have lunch at the De Le Warr Pavilion a short drive down the coast from Hastings in Bexhill on Sea. 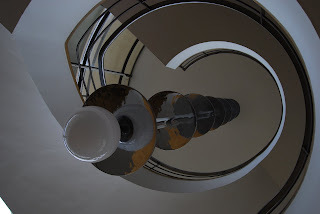 I'd wanted to visit the Pavilion for a while, I'm quite a fan of 1930's modernist architecture and the Pavilion has recently had millions spent refurbishing it to look exactly as it did in its heyday, nowadays it houses an art gallery space. I was also inspired after reading about a meal Douglas Blyde had there recently in his excellent blog Intoxicating Prose. The building is stunning - the kind of seaside architecture we used to be so good at in this country, looking almost like a cruise liner on land. Considering when it was built, it shows that quality design doesn't age. It could have been designed and built yesterday, and doubtless will look just as timeless in another 80 years or so. But onto the food, the restaurant, true to the modernist building housing it is pretty stark. But there are great views of the sea down one entire side with floor to ceiling glass windows. I'll just say this now - the food is excellent. 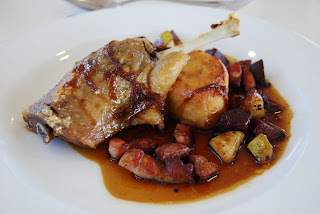 Really very good indeed - I skipped the starters and ordered a confit leg of Duck, with smoked bacon, beetroot and pear with fondant potato and red wine jus. It was quite possibly the best thing Ive eaten in ages. 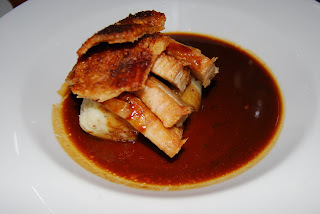 My partner went for the Cumberland Sausage with mashed potato, savoy cabbage and onion gravy, now this is standard pub grub fare - she's eaten this scores of times, but she made the rather bold statement that it "Was the best sausage and mash I've ever eaten". I tried it, and I'm inclined to agree. For dessert I went for the Chocolate and Raspberry torte - it was huge, not quite the same standard as the main, I'd seemingly got given a slice a bit 'short' on the raspberry side but still very good indeed. If you in the area, visit the lovely building, have a look at the art, and then grab lunch or dinner - the prices, considering how good the food is, are a total bargain. The last foodie place I visited was Judges Bakery and Deli. located in Hastings old Town, Its owned by the founders of Green and Black chocolate, and has a reputation for baking incredibly good bread. It's also houses a lovely little deli. I tried some of the bread, and it was indeed great. I wish I had a bakers who churned out a similarly quality product locally. So that was Hastings, I enjoyed the visit and ate some fantastic food. You can't ask for more than that really.